Queen Elizabeth Pocket Beagles are the smallest rare breed hound in existence. Six generations in development they are no longer considered a cross-breed. 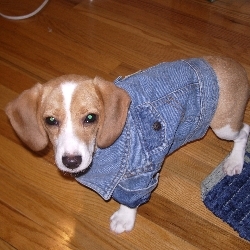 In fact they are the only actual 'pocket beagle' breed. By contrast there are a number of people breeding standard beagles that are a little smaller than average and calling them 'pocket beagles' as a marketing hype meaning: small beagle. AKC recognizes those to be 13 inch beagles as they are genetically the same as a standard beagle. The Queen Elizabeth Pocket Beagle Breed foundation is fifteen years old and breeding rights are strictly limited. Affiliate foundation breeders in several states are supervised by the Queen Elizabeth Pocket Beagle Foundation and give discounts and free puppies to special need children and adult through the Get-A-Wag Program. Recently our current breeders reorganized as the Therapy Puppy Club. This is an overview of what makes Queen Elizabeth Pocket Beagles different from the popular standard beagle breed. Some Queen Elizabeth Pocket Beagles are maturing as small as five to ten pounds. They were bred down in size through several generations of miniaturization incorporating an out-crossed beagle - hound line. This genetically smaller heritage also produced rare colors and unusual patterns never before seen in the standard beagles. The classic tricolor, is still most recognizable as a beagle and the overall favorite of most puppy buyers. But other desirable colors and patterns include silver or mocha harlequin and tiger brindle. Queen Elizabeth Pocket Beagles have been shown once registered with the IABCA and also did well in agility. 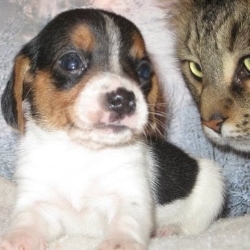 An out-crossed dog has a wider gene pool to draw from, and this is good as Queen Elizabeth Pocket Beagles have exhibited less inherent beagle defects than the standard beagle, making them healthier. We don't have epilepsy in our line. We offer a one year health warranty. Our teacup size is 4 to 15 lbs. 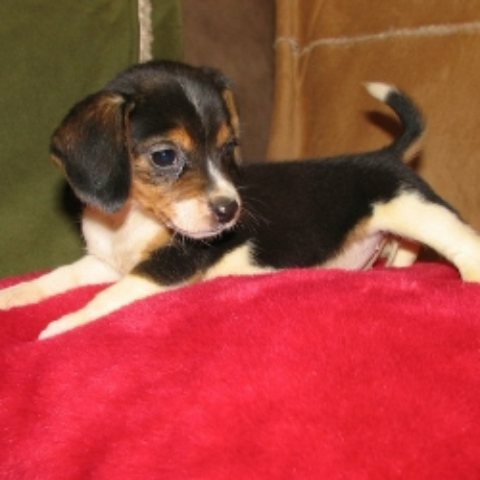 The smallest ones are called Pixiebeagles. Our toy size is 15 to 25 lbs. compared to a standard beagle which is typically 25 to 50 lbs. This means if you get a 'pocket beagle' puppy actually from 13-15 inch lines, you will sometimes get a puppy that throws back to the larger size. That's one of the reasons we don't advertise by height. Our perception of teacup size is based on actual mass: overall size, which weight reflects most closely. There are long-legged or short legged standard beagles for instance that vary greatly in size ....up to 20 lbs. variation can occur under one standard height category. 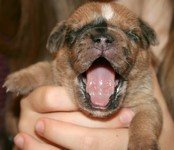 The reliable way to know you are getting a small dog is to go by actual weight of the parents measured against our careful weight comparisons of similar pups from related or past litters. Another difference in our dogs is the temperament we breed for. There is advantage to getting a housepet rather than a hunting dog. The AKC beagle is a classic standard hunting breed. While some do make very sweet pets, they are overall high energy hounds that insist on being exercised outside and will chase other animals or stray away from you very likely. They have always been bred for this. Some are just too restless to keep as a housedog. The pocket beagles you see on the internet are smaller type standard beagles. The Queen Elizabeth Pocket Beagles by contrast were created to be housepets. They would much rather be in the house on the sofa with you! They get most of their exercise just running about your home. They are less vocal, making them better apartment dogs, and are smart to house-train! Very little shedding if kept indoors, they are smaller and cleaner. 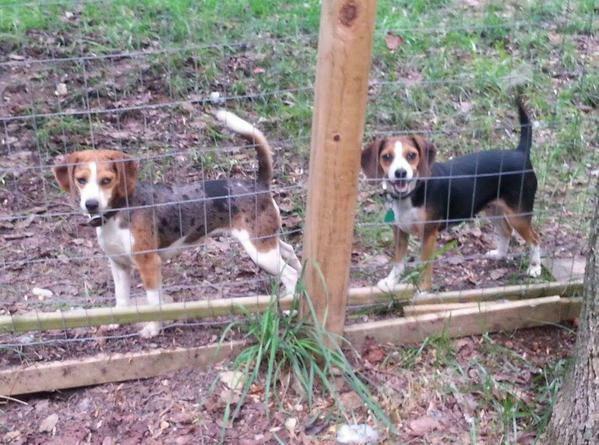 They don't have as strong prey-drive, so that means they aren't so determined to get outside and run the fields as a 'pocket beagle' from standard hunting beagle lines. They truly focus on you, their guardian, as their main interest in life. Many puppies can be trained to be an emotional support dog but the advantage of the Queen Elizabeth Pocket Beagle is its keen sense of smell combined with its sensitive nature. This is a breed that is literally tuned in to your every movement (and would often seem your thought)! They are able to detect subtle changes in your body chemistry through scent. And intinctively notice when something is emotionally or metabolically off if you are keeping them close to you from puppyhood on. With a little combined awareness on your part, you will be alerted your dog is cueing you in that 'something's wrong'. Many Queen Elizabeth Pocket Beagles serve this way as Emotional Support Therapy Dogs. And they also serve as Diabetic Detection Dogs and Seizure Alert Dogs. This teamwork between man and dog buys additional time to be proactive and prevent and protect yourself from further injury. You know 'what's different' now. But 'what's the same' in our breed is the best! The Queen Elizabeth Pocket Beagle is the same soft-eared, loving eyed companion you were hoping to find in your choice of puppy. Maybe you had a beagle before? Then this breed will not disappoint you. Its characteristic beagle devotion remains unsurpassed as a good family dog. Our dogs look more like a puppy as an adult. Children and adults find that endearing. They are cuddly and cute acting. Good with children and other pets. They love to snuggle and make great bed partners. They practically seem to read your mind at times, they want so much to please!